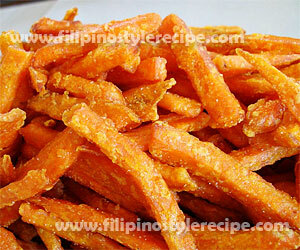 Filipino Style Recipe: Baked kamote fries is a popular snack that consists of slices of sweet potatoes. The sweet potatoes coated in cornstarch then seasoned with olive oil, cayenne and salt. Baked in a preheat oven for 30 minutes or until browned and crisp then serve as snack, appetizer or side dish. 1. In a large bowl, combine potatoes and cornstarch then stir to coat evenly. Strain to remove excess cornstarch. 2. In a separate bowl, combine potatoes, olive oil, cayenne and salt then toss to coat evenly. 3. Arrange in grease baking sheet then bake in a preheated oven over 400 degrees Fahrenheit for 30 minutes. (15 minutes each side or until browned). 4. Turn off the heat then let it cool inside the oven for another 15 minutes. Serve with dipping sauce. 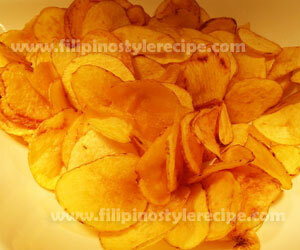 Filipino Style Recipe: Potato chip is a popular snack that consists of thin slices of potatoes. The chips deep fried until golden brown and crispy. The basic potato chips are seasoned with salt; other varieties are flavored in cheese, herbs, sour cream and other seasonings. 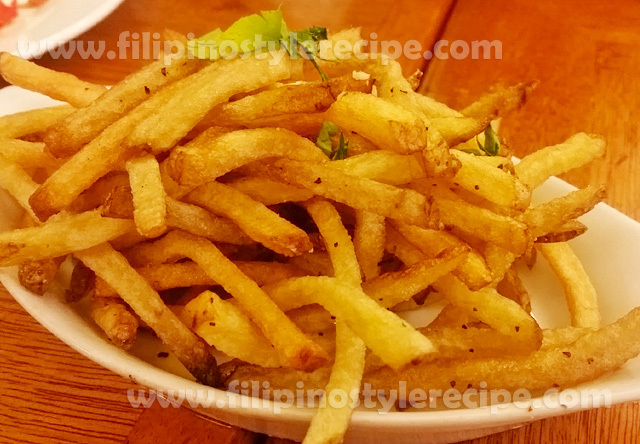 This is commonly served as snack, appetizer or side dish. 1. In a large container, pour cold water then add a dash of salt. Stir until dissolve. 2. 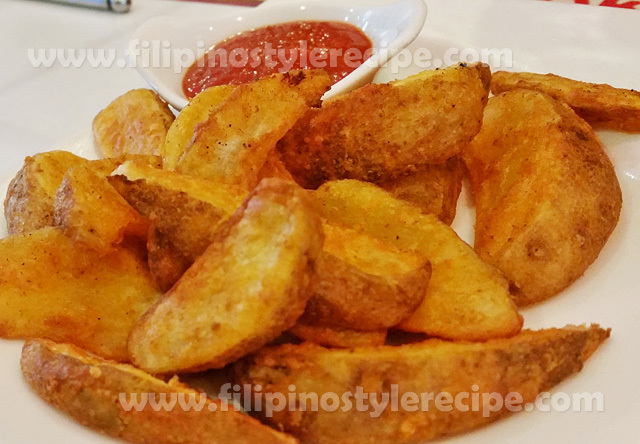 Using a slicer, slice the potatoes into thin slices then soak them in cold salted water for an hour. 3. Pat the potatoes very dry with paper towels. 1. 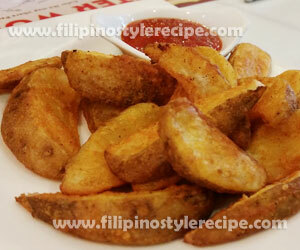 In a frying pan, heat oil then deep fry potatoes until golden brown and crispy. 2. Drain on paper towels then sprinkle with salt. Transfer to serving bowl then serve with your favorite dip.